that's why la.. i haven't even chop once and SSG dah 3 times!! hehehehe dunno how PW works lah..
what you mean going through each post? you can check through 3p the ones you did for them right? Hi Friend.. Interesting post.. Nice blog.. Keep up the good work.. Do visit my blog http://www.sparkzspot.com and post your comments.. Take care mate.. Cheers!!! Oh no, Gagay is crying everywhere! Hugs!! We want PR! PR! PR! Lol!! Looking for me? Last night slept early, kepala dah tingtong! Lol!! big congratulations on your slogbite feature Mariuca!!! Oh hohohoho u oso panicking Mon? He he don worry, makeover time mah LOL!!!! Be back soon sweetie! He he he don la cry Mon, come we have coffee together-gether here LOl! He he Mon have to try and fix MPG’s problem with EC, dats why changing new template now!! hehe *hugs* now I feel better!!! YAY! 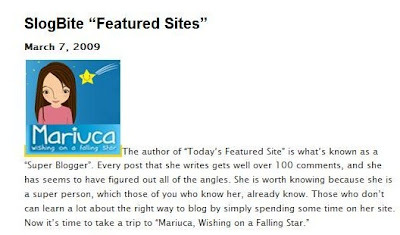 Thanks Kim, so happy SB featured Mariuca woo hoo! until now I still don't know what's going on.. :-( nvm, I'll wait!!! Wats going on with what eh Mon? I oso not yet zzzzz, too worried abt my makeover ni to be happily zzzzz-ing away ha ha!! Locked out?? I just tried to visit MPG and I got a message from Blogger/Blogspot saying I had to be invited??!! Help!! Oh, I see... LJ locked us all out while you spin around in a phone booth and turn into Super-MPG? Looking forward to seeing your new look (and scents) while I'm at jury duty tomorrow. Thanks dear *HUGS*... i miss chatting with you all too ..
plenty of time meh? I'm still doing my EC round now...haha.. I'm good! How abt u Debbs?? Ala Debbs, actually not much difference, main purpose is to try and fix the ec prob u see… so have to reinstall all widgets one by one, then get EC to check and see ok or not, blh? Ish ish!!! So when I open my blog nanti, only some of the widgets will be there, must do bit by bit, to ensure the problem takde! wah! for both WOAFS and MPG? why EC needs to check and see ok or not? Only for MPG Mon, it seems got prob so dats why rushing to fix it huhuhu! But EC has been very kind la to me, after I cried my heart out ha ha ahahhahahhaha!!!! Dats the problem la, got unwanted ads it seems at MPG, as in pop-ups! So I don know where it’s coming from, so dats why am changing template, then install widgets in phases. EC has to check for me, so we can try to figure out where is it coming from, that’s why I have to remove all my widgets for now huhuhuhu! :( So later when u se MPG, only the important ones will be there for now. If all okay then slowly2 I can add back my widgets. Thanks Debbs! Now JS pulak buat hal, tak leh import comments at MPG huhuhuh, LJ is bugging her bf now for me, thanks LJ, love you la! glad to hear that...hopefully everything is alright! Takleh import? Sabar ok? Good things come to those who wait! :):) Hugsy! Go LJ go! so who told u abt the pop-up ads? Morning Janice! Eh why la u so happy eh???? crazy la!!! hope they go check properly!! wah makeover at mpg?!!! no wonder, i can't enter!! can't wait t see new mpg!! i sos wonder the same thing just now lj! maybe it means dear? How's thing going on with MPG's EC? Everything sorted out? Just so you know, I don't see any pop up there lah.. Ish2..
LJ, you clearing 3P? have to remove all the post from them?? wait to see the new look! LJ is the best! yahoo!! Congratulations for being the SB featured site :D! woo hoo laketrees is here today!!! Hey ECL, have u updated ur url feed? I hope Gagay won’t call me ate la, sister means kak and kak means OLD! Huhuhuhu! Sorry for the shutdown Emila, takut org mengomen at MPG while doing the makeover, hence the temp shut down, but MPG is open for biz oredi YAY! Shemah, make that 4 CHOPs for SSg so far! Go Shemah Go!! Yeah that’s what she told me too, but nemind no need to call me kak, seriously makes me feel like KAK LONG he he heheheh! Dat is correct Debbs, remember kak GP? ROTFLMAOM!!! heheheheh.. belum register lagi! okay okay.. i'm going now!! there's no referral link you want me to register under? :'( :'( I haven't even had one CHOP!! hahahahaha... a'ah kan.. heheheh.. akak GP!! has a nice ring to it! LOL! He he he yeah lor…dah nice2 Genie Princess alih2 ada K kat depan tu muahahahhahahha! alright.. i'm eating apples for breakfast! LOL! drastic sungguh! 2 years is a long wait Shemah, I do hope u get some good news next PR round kay? Uwah mmg drastic tu! Apples for breakfast huhuhuhu! when i woke up, i found J cutting apples... and so i thought this must be a sign for me to start the big D! LOL! Apple is my least fave fruit, eh wait that’s papaya! Papaya mcm tak best je kan? He he! hahahaha a'ahh... you know debbs.. according to my stats.. someone search in my blog for my ex-boyfriend. Weird eh?? papaya got certain smell lah.. i wouldn't eat it kalau tak perah limau! hahahaha thanks so much for the compliment.. i'm rolling and revelling in the puji pujian!! LOL! I love apples, esp green ones. I have some Fuji apples here right now yums!! :) I don't enjoy papaya either, Marzie, unless if it's really sweet.